This success coupled with beautiful products makes the business the perfect case study for a few quick lessons and an inspired start to your creative business day! These three things are so easy to spot that you might be thinking – ‘I know all this stuff’, but the real question is... are you implementing them? Collaborate: Huge companies and small creative collaborations are not always a match made in heaven, but when done right it’s really successful. CK enlisted the help of local crafters, The New Craft Society to host instore workshops. Instead of running the project in house they collaborated and embraced others, making the idea more creditable and desirable to creatives. Our own ideas can be wonderful, but when we work together they are even better. Take a leaf from Cath’s book on this one. Embrace Social Media: I know what you’re thinking, ‘duh – I know that’. However, the majority of business owners still aren't using social media effectively, yet there is so much info, stats and ideas out there on how to do it right. Remember it’s a useful tool – dedicate time to it, use it, reap the rewards. The example from CK is their clever use of an Instagram workshop to share products in a very ‘non-spammy’, pretty way. A clever use of Instagram and most people didn’t even notice the product showcase element. Reward Customers: Once again so easy! I would still shop at Cath Kidston even if I wasn’t being rewarded. The brand does, however reward repeat customers for buying over a certain amount and the ‘freebie’ you receive is of value and great quality. Giving back makes customers even more loyal, find a way that suits you, either via small discounts, loyalty programs or small gifts. Another CK example is their 20% off offer at their Covent Garden (London) Store recently. 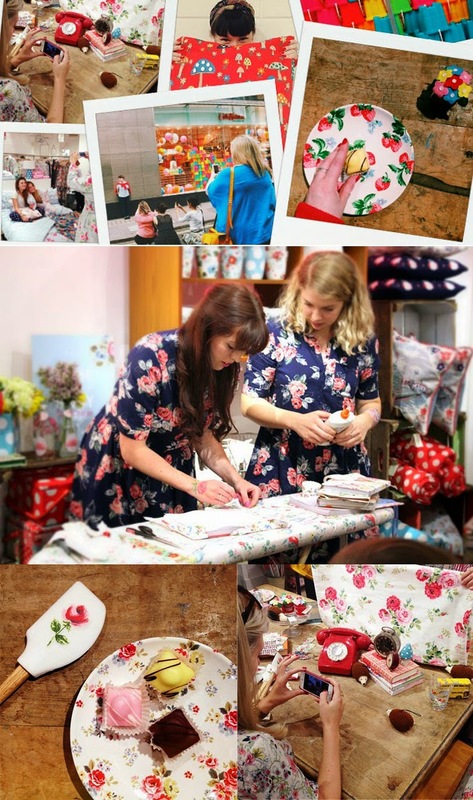 The photos below show the Instagram workshop and the ladies from The New Craft Society. Besides these ridiculously easy ideas to add into your business planning there are about a hundred (or more) other lessons we can learn from Cath Kidston as a company. I suggest always keeping an eye on successful brands that you admire and inspecting how they do business, which in turn can inspire simple and effective changes. Just view the CK website for instance and look around, or take a glance at their social media – lessons and tips are just waiting to be discovered.